This is a quick piece I created focusing on the blues and greys in a squirrels fur - which quickly got out of hand and I decided to paint the whole squirrel blue. 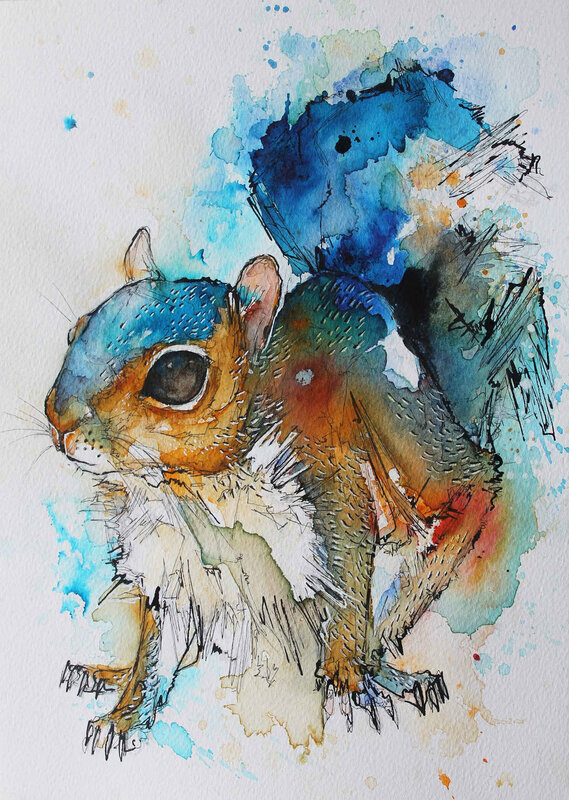 This squirrel was primarily painted in Brusho pigment. April 20, 2017 by Laura Bennett. Hi, I am a self-taught watercolourist from England, I started oddkness.com to serve me as a journal to discover who I was and where I stand as an artist. My work is devoted to the glorification of animals, being deprived their companionship in childhood has led me to become even more enchanted by their existence. I hope you enjoy my posts, and if you do — don’t be a stranger, I’d love to hear from you. Hi, I’m Laura, a joyful vegan and watercolour dabbler! I started oddkness.com to serve me as a journal to discover who I was and where I stand as an artist. I like making a mess with masking tape, ink and watercolours in the name of our feathery, furry and not so furry friends. If you share my passion, would like to make a purchase, or just want to say ‘Hi’… feel free to contact me.